Projected top 7: The top 7 is going to start with a handful of girls listed above but there are 2-4 others that could be contributors by the end of the season. So I will say our top 7 is TBD. I never like to project the top 7 as every year is a new year and every runner has an equal shot at the top 7. This is a position that is earned by each athlete and this year we have a lot of girls that have been working hard this summer to pursue the opportunity to make their mark in the Varsity lineup. Coach's thoughts on the team: In 2018, the Knights return the core of last year's 18th place state team. Though the Knight's graduated 3 of the Top 7, this year the Knights return a wealth of experience with some young energy to complement their wisdom. This summer the Knights are coming off a trip to Colorado exploring the beauty of the West while developing the bonds and trust necessary to take the next step. This year's team is as good as they dream of being. We have the horses to carry us along the way. The secret to success remains in the tightness of our pack and the growth and development that will take place over the next 12+ weeks. The future looks bright for the Knights! GO KNIGHTS!! Coach's thoughts on the team: All of my top seven are back! Five of them are seniors and looking very good. They have been very consistent this summer and should be strong and ready to go at the Early Bird Invitational at Fenton HS. My other two in the top seven are all-stater Lauren Johnston and sophomore Jubilee Rukin. Once again 4,5,6,7 could be up for grabs with a freshman coming in who finished 4th in IESA state cross country last fall - Hailey Henry. I also have five new freshmen who have been incredibly dedicated to their running over the summer so... time will tell. Repka ran a great race at Detweiller at Dark (17:54). The key is having her fresh and ready to go come late October. Frommer and Johnston have a pretty good sense of timing and I think will show excellent progress with each meet. Frommer is experienced at running at state in both track and xc, so I am looking for big things from her during her senior year. Lauren Johnston had a huge state meet!! I would have been excited with a top 50 finish and a time around 17:45, so what she pulled off was absolutely amazing. She moved up steadily throughout the race, and was around the 30-33rd place by the halfway point, with 1000 meters to go she had moved into 25th and obviously held that position to the end. Lauren is an endurance machine; she lacks a top gear, but will steadily close on much faster girls over the course of three miles. I am excited to see what she can do this year. Projected top 7: Walker, Wichlac. Jordan, Parker, ??? Coach's thoughts on the team: We return 4 of our top 5 runners. We have a good core group of runners that have put in a solid summer of training. We are excited about the new runners that we have coming in. After just missing a trip to state last year, the team is driven to get back. Our team is looking forward to this season and ready to put in some quality work. Projected top 7: No clue, but it better include most of the girls listed above! Coach's thoughts on the team: Good group. Young, but accomplished a lot last year. We won't confuse goals with expectations. We'll focus on ourselves and let the rest fall in place. 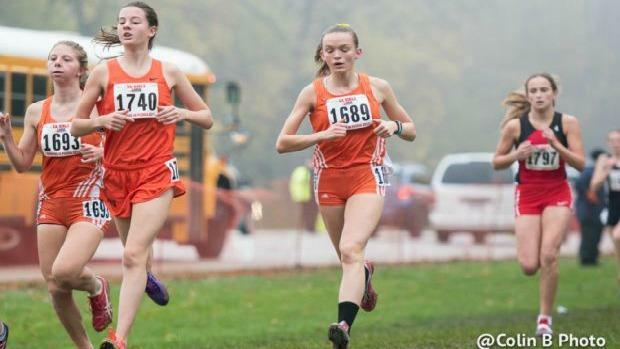 Newcomers: Ellise Condon ran 5:35 in middle school at St. Peter in Arlington Heights last spring. Great work ethic, great energy, great addition. Coach's thoughts on the team: This will be a very interesting season. We have a very solid top 3 in Kate, Liz, and Anne Marie who are 5:10 range for 1600m and sub-11 for 3200m, but have a lot of inexperienced youth behind them. Roy got some postseason experience last year, hopefully, that will help her, but she missed half the season last year with a foot issue. We will be without Christina Buckstaff for a while, perhaps the season, as she had hip surgery in early May. Buckstaff is back cross training for us after a huge breakthrough last fall. Soph. Mia Solano is an unknown diamond in the rough but will need some seasoning. Seeberger and Lopez are talented athletes, but both will take all season to show their potential with limited distance training. Casillas ran 11:35 as a frosh, but battled nagging hamstring issues most of last year, is healthy and has had a productive summer so far. Condon has been a great addition. She's full of energy and spirit and is a hard worker with a lot of upside. We will have to be very patient with this group and do our very best to keep our pieces healthy to be successful. We are excited about this group's potential and to see them develop as a team this fall. Coach's thoughts on the team: Our team took a few hits this summer, as we lost Abby Schrobilgen (our projected number two). With that being said, I feel like our projected varsity runners had a strong summer. I don't know if we will have the punch up front from last year, but we should be stronger in our 4-7 this year. At Mud Mountain, Korak ran a 25-second course PR and looks fit, as she ran an 18:46. We also saw huge improvements from Hannah Stuart. If our girls can stay healthy and we get a few positive surprises, we should be able to qualify for State and (hopefully) have a better finish this year than last. Projected top 7: Too soon to tell.. .sorry. Newcomers: We have a strong group of freshman girls coming in from Minooka and Channahon Jr. High. This is the largest group we have had participated in the summer running program, and they are coming in excited about the sport and ready to have an impact on this team. Time will tell how that all turns out, but I am excited about this group. Coach's thoughts on the team: I really like the look of this team, and there is no doubt we are going to get better as the season progresses. There's a certain intensity about this group that is going to be key. As always, we want to be a team that does things the right way and races with enthusiasm. I know this is a team that has the ability to qualify for the state meet, and then go out there and put together a great team race. Vivian Van Eck, Kate Gall, and Julia Dames look to be the leaders on this team. It's exciting to see a new group emerge and take ownership of this team. However, we have plenty of others that are crew going to be able to put themselves in position to have an impact on this team. Coach's thoughts on the team: We are fortunate enough to be returning almost all of our varsity athletes. Our tight pack will continue to be our strength moving forward. Each member of the team has different strengths and they have really learned to work together to capitalize on those positive aspects of their training and racing. We seem to have a very strong freshman class. Very few of them have competitive running experience but this is one of the strongest and deepest looking freshman groups we have had an a while. We are very excited to see how the team can add to its depth and experience this cross country season. Projected top 7: Above first 5 listed return from state team. Newcomers: Freshman have made great progress this summer, but too early to know if any will impact the varsity team. Coach's thoughts on the team: We return 11 of our top 13 from last year. We finished strong last season and added a very good track season. The summer has gone very well and the team is looking to improve on last years state meet finish. Christiansen will lead the way and we hope to have a strong pack following.